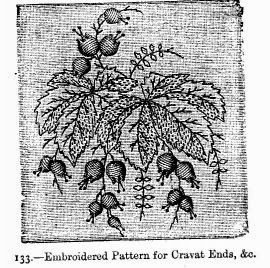 Materials: Muslin, cambric, or linen; Messrs. Walter Evans and Co.'s embroidery cotton No. 24, or fine black China silk. This graceful design is worked in raised satin stitch (see Nos. 76 and 77, Embroidery Instructions) and back stitching, or point Russe. Black silk may be introduced at will, and the delicate leaves may be stitched in fine black silk, and the flowers embroidered in white, with the stamens in black silk. Materials: A basket of fine wicker-work; 1 skein of black chenille, and 3 of blue chenille. 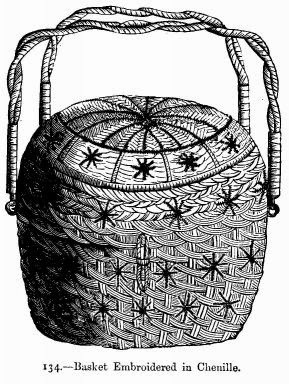 This small round basket measures seven inches across; it has a cover and two handles. The wicker is very delicately plaited, and is ornamented with a pattern in chenille which is very easy to work. Upon the cover, work in point Russe one large star in blue chenille, with the centre and outer circle in black. All round, work small stars in blue chenille, with a black stitch in the centre. The position of these stars is shown in our illustration. The basket requires no mounting; it is not even lined.